These Leviwands are the all-purpose performance and practice wand. These wands allow you to explore the entire range of traditional Leviwand play, as well as the broadening world of Contact Staff and Poi-inspired Leviwand tech. 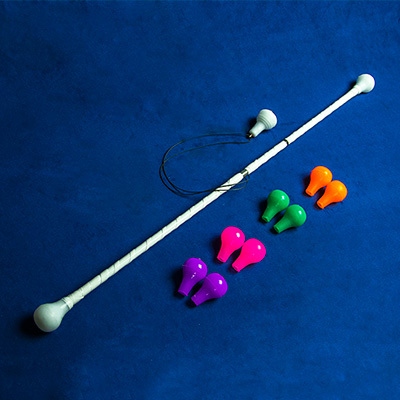 These wands come with a default short-string setup (with swivel and Shadow Cord fingerloop). If you would like a long-string setup, select Extra Shadow Cord from the options below. All Sparkle tape wands, have a layer of clear silicone over the sparkles to protect them and enable the wand to be used for contact. This 28.5" wand is suited for both short and long string wand spinners. We offer two options: a heavier version and a lighter version (each is approximately the same weight as its fire equivalent). The Heavy Wand is made of steel, making it very strong and resistant to bending. Its weight makes the wand more stable during contact moves, and makes it less affected by wind when spinning. It is generally preferred by short string wand spinners and those attempting to incorporate contact staff and poi moves into their Leviwand tech. The Light Wand is made of 7075-T6 aluminum, which is twice as hard to bend as most other types of aluminum available. Its light weight makes it extremely responsive to sharp changes in direction. It is generally preferred by long string wanders. These wands come with a silicone wrap around the body of the wand. In addition to providing color, this silicone wrap's grippy surface allows you to do contact staff movements like fishtails with your wand. Shadow Cord is a soft and durable Leviwand leash, made from a material used extensively by NASA. This fine cord has a tensile strength of 200lbs, with the flame resistance of Kevlar and three times its abrasion resistance. This ensures that the leash won’t get worn down sliding through the wand’s center hole. We offer a default Shadow Cord fingerloop, but you can upgrade to a leather fingerloop or ball handles for tosses (Dark Monk Nip Grips or Lanternsmith PomGrips) to suit your style. This wand comes with a short-string leash attached. If you are a long-string wander, you can add an extra 20ft of Shadow Cord to your order to make your wand leash length perfect for your style. If you wish to restring your Leviwands, we recommend using a Double Fisherman's Knot. Click here for an animated guide on this knot. 1) A loop made out of Shadow Cord. You can feed the loop between two fingers and then fold the loop down around the two fingers to tighten it in place, or wrap it around your arm or wrist. 2) A leather fingerloop. This cinches around a finger, and people generally find it more comfortable than a Shadow Cord loop. 3) A toss Pom grip handle. This is a small silicone knob that fits comfortably in the hand. Some creative wand spinners have begun playing around with Leviwand tosses (much like one would do poi tosses with ball handles), and Pom grips allow for that. 4) UltraKnobs made by UltraPoi, are rechargeable RGB LED silicone handles. This knob can be set to any of the colors of the rainbow, as well as strobe patterns that create intricate light trails while you spin. NOTE This is an outdated picture. While we try really hard to keep our photography up to date, occasionally we will upgrade a product and not yet have updated the picture on the website. When you purchase the a product, you are purchasing our latest version of that product, not what is specifically in the pictures on the product page. We are sorry but this product is temporarily out of stock.